Heimo Mikkola, 68, an avid birdwatcher since age 11, retired in 2007 from a lifelong career in the United Nations. At the end of that career he was "Ambassador of Food," the resident representative of the U.N. Food and Agriculture Organization. As head of a diplomatic mission, he led Food and Agriculture Organization activities in countries in Africa and South America. He visited 127 countries during his foreign assignments -- at the same time publishing more than 150 owl papers and books. The second edition of Mikkola's latest book, "Owls of the World: A Photographic Guide," is just being released. The 528-page book, published by Firefly Books, includes photos, range maps and detailed descriptions of 268 owl species. The second edition of "Owls of the World" is being released only a year after the first edition, largely because of accelerating advances in owl research. The advances come from DNA testing that is helping scientists differentiate between species and from studies of other aspects of owls' biology, ranges and vocalizations. "So many new owl species and subspecies were separated very soon after the first edition that we felt it to be important to take a second edition only a year after the first," said Mikkola, adding that even he has seen only half of the species in the book. "One of the main aims of the book is to make people realize how many rare owls there are, and how many of them we can easily lose in the near future if we don't take relevant steps to protect the habitats and reduce climate change." With the speed at which new owl species are being identified, Mikkola said he expects an eventual third edition of "Owls of the World" will cover at least 275 species. The first edition described 249 species. Mikkola, who holds a Ph.D. in applied zoology and limnology – the study of inland waters – from the University of Kuopio, Finland, has 40 years experience in fisheries and aquaculture development. He said he realized early on in his career that he couldn't support his family by studying owls, "so I switched my career toward fish and food." "Luckily I always kept owls as my main hobby instead of golf or something like that," he said. "So when I retired from 'food business,' I had an easy way to go back to my owls." Mikkola currently lives in Royal Wootton Bassett, Wiltshire, England, but continues as an adjunct professor of fisheries and aquaculture at the University of Eastern Finland. He recently taught in the National Agriculture University in Kazakhstan, as a visiting professor. Mikkola notes that owls continue to be feared and reviled in many parts of the world. They're frequently considered omens of bad luck and death. Humans tend to be frightened of powerful eye patterns, he adds, and owls have some of the most conspicuous, compelling eyes in the world. "It is highly likely that owls were among the first birds to play an important role in the legends and myths of ancient humans, probably because their vocalization in the dead of night caused havoc in the superstitious mind," Mikkola said. "The human-like appearance of owls, combined with their nocturnal habits and haunting vocalizations, continues to invoke fear and superstition among modern people of many different cultures." A 1990s study found that 39 percent of people in the United Kingdom feared owls, and Mikkola said he frequently hears the calls of tawny owls added to movie soundtracks to suggest evil and supernatural forces. 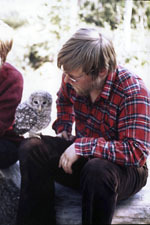 Among Mikkola's many publications is the 1983 "Owls of Europe," now out of print. An update of that book is on Mikkola's to-do list for his "retirement." Mikkola channels profits from his books into education and research, financing books and fees for college students and funding research and travel grants in South America for owl researchers with no other funding opportunities. Years ago, he notes, his own college fees and books were financed by his high school biology teacher because Mikkola's family lacked the money. Charter, 36, has been scientific coordinator of the Society for the Protection of Nature in Israel's barn owl nesting box project since 2007. The national research project, which receives funds from three governmental ministries and a private fund, involves a team of bird banders, naturalists and ornithologists who monitor breeding and other aspects of barn owl biology. The project promotes using owls instead of poison to control rats and other pests. It has resulted in placement of nearly 3,000 barn owl nesting boxes in seven regions within Israel, says Alan Sieradzki, who nominated Charter for the award. "Amazingly, this barn owl nesting scheme has transcended Middle Eastern politics and cultures by expanding to Jordan and the Palestinian Authorities with the full support of the governments involved," said Sieradzki, a British naturalist and senior researcher with the Global Owl Project. Charter will accept the award at the International Festival of Owls awards banquet March 8, 2014, at the Valley High Golf Club, between Houston and Hokah, Minn. He also will speak that morning to the general public. Charter said, "An important goal of our barn owl project is to raise public awareness about the usefulness of raptors and the benefits that humans can derive from environmentally friendly agricultural practices. In addition, barn owls are the ultimate tool to explain to people that biodiversity is important." Charter said, "The barn owl population in Israel is one of the highest in the world and since 1983 the owls have been used in Israel as biological pest control agents of rodents. This project is based on the addition of large numbers of barn owl nest-boxes in farmland to create a friendly environment for people and wildlife where pesticide use is decreased." "Unlike most other nest-box programs in the world, where projects are organized by wildlife organizations, in Israel farmers added 95 percent of the nest boxes for rodent control," Charter said. The barn owl project has been the subject of media coverage on the Discovery Channel and the BBC in addition to ornithological and local publications. Israel's small size, Charter notes, means it's difficult to protect animals because they frequently cross borders to other countries. When rodents are killed by poison, predators such as owls are poisoned by eating the dead or dying rodents. Charter says that even if Israel completely changes the use of pesticides to protect animals within its borders, predators may be poisoned in nearby countries, Charter says. The poisons also end up in local rivers and groundwater. "It is therefore of high importance for Israel to work with its neighbors to try to reduce pesticide use in other countries also," said Charter, who lives near Nazareth, Israel, and not far from the Palestinian city of Jenin. "Even though barn owls are accepted by Jewish farmers in Israel, some Arab farmers continue to fear and persecute them," Charter said. "We therefore want to bring Arab minorities and Jewish farmers together in Israel. Charter says owls may spook people because the birds hunt at night and, due to the design of their feathers, make almost no sound when they fly. Owls are frequently seen as bad omens around the world. "If we have no owls, which animal will prey on the rodents that eat our crops, infest our villages and homes?" Charter asked. "Owls are keystone predators that can be used as biological indicators of healthy environments. "When there are owls and the owl populations are healthy, then we should expect that many organisms' population are also OK. When there are no owls, it is a bad sign that many other populations of animals are also affected."